Welcome to the fifth week of our Fun in the Summer Sun event! 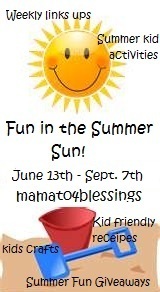 will be hosting Fun in the Summer Fun link up events. Sophia sitting on the Eichten’s mouse. On Wednesday, we visited Eichtens farm which is an all-natural artisan cheese company and buffalo farm. They produce a Dutch Gouda and a variety of other European-style cheeses. Olivia sitting on the dairy cow statue. The bison at Eichtens are totally free from any growth hormones, antibiotics, or other medications. Their animals are raised on native pasture grasses (grass fed), and hay/oats. They raise the feed the bison consume. Some of the buffalo herd at Eichten’s. There were quite a few young ones in the herd. According to Eichtens’ website, “A strong relationship between the human and buffalo has existed for thousands of years. Bison sustained the lives of the explorers and settlers going west as well as the Native American. The older and younger animals sat right next to one another. “They were believed to be the most important of the wild animals in the development of North America. Once an integral part of the Native Americans’ way of life, the American Bison is again a central part of the lives of many Americans today. The girls wanted to sit on the buffalo statue. well-worn path from the dirt road to the buffalo. Olivia holding some strawberries she picked. Also on Wednesday, we picked two flats of strawberries. Sophia looking for strawberries at the berry patch. We’re going to make a variety of food from the strawberries as well as eat them plain. This year, we’re going to try canning a strawberry-lemonade drink so the fresh strawberry taste can be enjoyed during the winter. 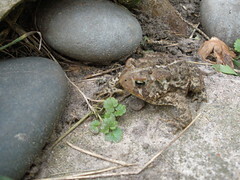 We’ve been seeing hundreds of baby toads here, and came across an idea for helping the toads survive the hot, summer heat. Olivia holding a baby toad. when we were planting flowers. Now it’s your turn! What kid-friendly summer activities does your family enjoy doing? I didn't know there was a buffalo farm like that. What a cool trip!